I am so moved & inspired by this project: I'm Down with You! Today I have felt a familiar calling...to get back to spending time with kids with special needs, particularly those with Downs. On Saturday, I was graciously invited to the I'm Down with You set by the filmmaker, Lubosh. What a beautiful project this is! The kids were so joyful, soulful, in the present moment, confident and loving, all that from just an extra chromosome. Check out this clip of what is yet to come!! 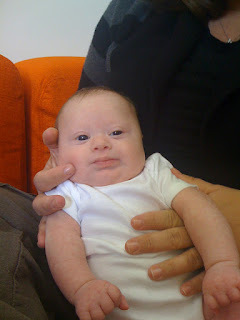 Picture of the yummy 6 week old Jeremy Elan. His parents were so authentically raw. I just returned home from Retreat & studying with Paul Ferrini in Parish Florida. It has been 6 months since I began reading his books & practicing/living Real Happiness. I am so grateful for this work, for I am today experiencing the fruits of the labor. I find myself more accepting of who I am and have compassion for the parts of me that I don't necessarily like. I am more accepting and loving with others. I connect to the divine inside of me in meditation and throughout out the days, and see the light inside of you. I am aware & connected to a little Jodi (my inner-child) who is reminding me not to betray myself. I am healing. A huge piece of this work that has aided me so greatly is that I get that I am responsible for everything I feel, I say, I think & I do. And everyone else is responsible for what they feel, they say, they think & they do. How freeing is that! I get to take everyone off the hook and take responsibility for myself. I see this showing up clearly in my relationship with David, and it fits just right. I feel very empowered & so in my heart. 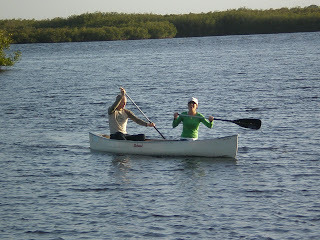 On a break, I went canoeing with Kolby - down the north bank of the Manatee River in Parish Florida, DaySpring Retreat Center.